Property Info: 2 BR, 2 BA waterfront unit, Sleeps up to 6. Caribe Resort Condominiums are situated in Orange Beach Alabama on the Gulf Coast, approximately 1 mile from the Florida-Alabama border, Caribe Resort is a waterfront community with exceptional water views and easy access to the area’s boating, fishing, shopping dining attractions and, of course, miles of white-sand beaches. The resort amenities at Caribe Condominiums are second to none and include water-slides, two outdoor pools, a Lazy River, multiple indoor pools, hot-tubs, a sauna, a steam-room, exercise facilities, tennis courts, and a golf putting green, all just a short elevator ride away. Furthermore, this popular community features game-rooms, a deli and snack bar. 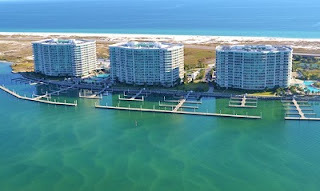 This beach resort destination has 24-hour guarded entry gate, assigned covered parking, and shuttle service to Gulf Coast beaches, shopping, attractions, and an array of dining/entertainment venues. Situated on the emerald waters of Alabama’s Gulf Coast, Orange Beach has subtropical weather and miles of white-sand beaches and access to the interior waterways north of the popular beaches. Visitors can also enjoy a lengthy list of other attractions including Adventure Island, deep-sea fishing, numerous area Golf Courses, the Alabama Gulf Coast Zoo, Waterville USA, The Wharf and more. Enjoy the many popular Orange Beach eateries like Voyagers, Cosmos’s, Ginny Lane, Louisiana Lagniappe and more. There are many lodging options in Orange Beach as well – from vacation rentals by owners to luxury beach hotels, there’s something for everyone. Whether you’re ready for fun and adventure, a carefree day on the beach, tasty cuisine or an Orange Beach home – you can find it all on Alabama’s Gulf Coast.